The truce in the Iraqi city of Najaf came to an end on Sunday and fighting has resumed in earnest around the Shrine of Imam Ali. The BBC's Matthew Price was one of the few western reporters in Najaf before journalists were banned from entering the city by Iraqi police. Najaf was quiet when we visited. We set off from Baghdad at 0630, speeding down the main highway, through bandit country and on to Kufa outside Najaf. There we came across our first militiamen loyal to cleric Moqtada Sadr. Teenagers, most of them with headscarves wrapped around their heads, holding - and pointing - AK47s rifles and grenade launchers. There were a load of them on the roof of a building next to us, aiming their weapons at us. But when they saw our accreditation (a letter from a cleric in the city) they let us through, and we drove up deserted streets. Most of the residents stayed inside all day. We drove round the outskirts, past road blocks and rubbish strewn across the road, and to the local hotel where reporters are staying. This was as far as we could go. We couldn't get to the shrine where the worst fighting has been concentrated. A car came down the road with a white cloth tied to its aerial. It was one of Moqtada Sadr's deputies. He told us the cleric had been injured, but was fine. And that they would fight to the death. A group of ambulances followed him out. We went with them to the city's hospital - and there they brought out fighters, bandaged and needing treatment. One of them, freshly bloodied from the fighting, was a huge bearded man. A doctor told us we couldn't go in. He said he was treating gunmen and civilians alike. We went to the Kufa mosque on the outskirts of Najaf. There the gunmen on the road block let us film them. They were chatty and polite. Once they had got to know us they smiled and relaxed. Friendly faces on teenagers holding guns and grenades. One took a grenade out of his pocket and grinned. A crowd gathered nearby. Two coffins were borne aloft, they were chanting for Moqtada Sadr, and against the Americans. A cleric came near to see who we were. Our translator explained. The cleric was cautious at first, but slowly warmed to us as we stayed with him, chatting and asking questions. The people were angry he said, and that was obvious. He told us the two coffins were for people who had been killed the night before by American forces. There was no way of checking this. He offered to lead us into the area where the coffins were being taken. The crowd started chanting as we went in; slapping their hands on their chests, punching the air, children among them shouting as loud as anyone there. 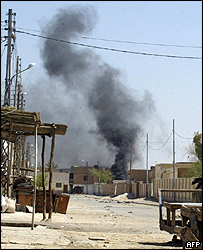 A man dressed all in black with a green bandana wound around his head stepped forward saying he was part of Sadr's militia. He recited a few verses from the Koran, and said the fighters are strong enough, with God's support, to win. As we left, I shook the cleric's hand. "There is no difference between us," he said. "We are both human beings"
"It was never like this under Saddam. We never had people dying like this." 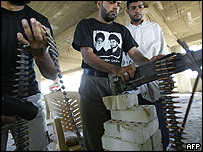 The cleric is a Shia Muslim and the Shia were persecuted under Saddam. We sped back north to Baghdad. All along the road, we saw people heading south - thousands of them, walking or in cars and on trucks. Some were holding Sadr's picture, some with their headscarves wrapped round their faces. It looked like a mass movement headed for Najaf in support of Sadr.